Prepare this easy Ricotta Asparagus Tart Recipe for your next brunch or serve as a side dish with baked chicken or fish for a lovely compliment to any meal. Brunch. Tis truly a beautiful, picturesque and uniquely satisfying meal, that makes for an fabulously fun time to hangout. And let me just say, I 100% endorse it. There’s something about getting a little festive to have a leisurely meal in the middle of the day. You can consolidate two meals for the day, enjoy a refreshing mimosa, and most importantly, dine on delicious food while visiting with your favorite people. 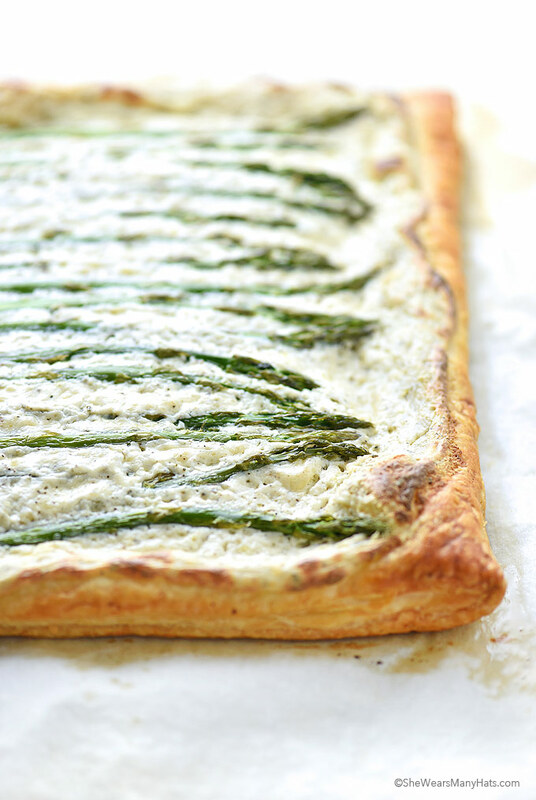 This Ricotta Asparagus Tart is one of my new favorite dishes to serve for brunch. 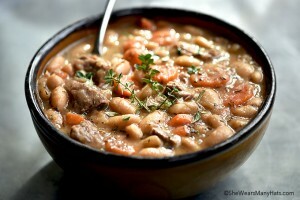 It’s savory and satisfying, and oh so pretty! Such a unique asparagus dish and while impressive, it’s super easy. Plus, I think that any reason to use puff pastry is a winner in my book. 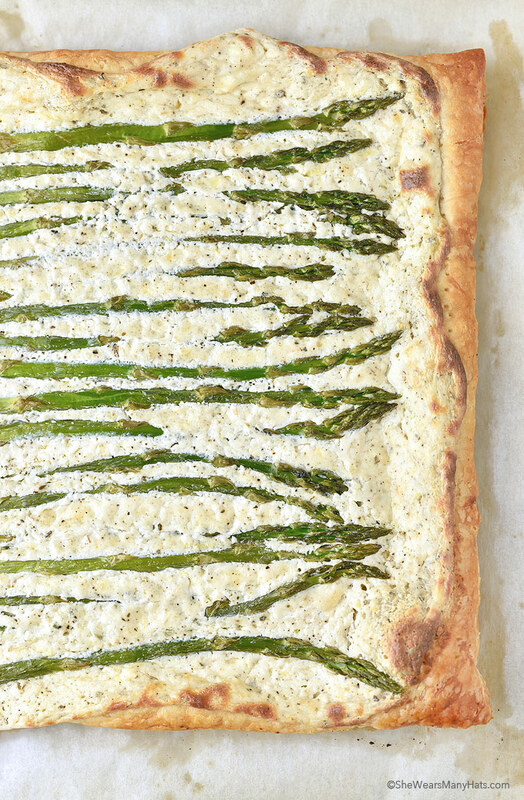 This Ricotta Asparagus Tart is not only for brunch. It’s great for dinner too. 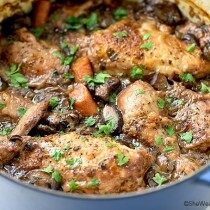 We enjoyed it with baked chicken just the other day. 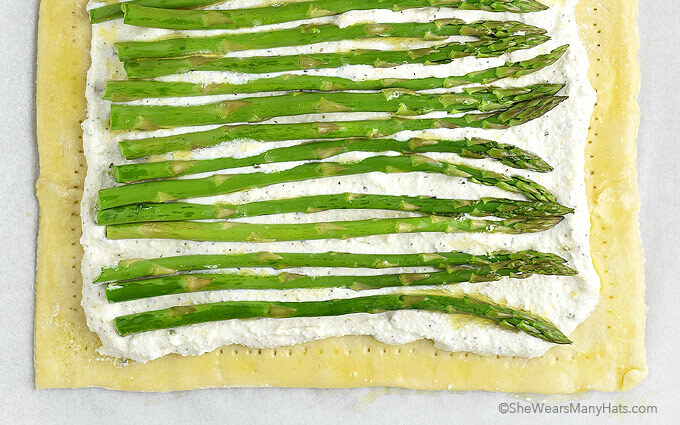 As I mentioned, the Ricotta Asparagus Tart Recipe is easy too. First, mix the ricotta, grated garlic, lemon zest, oregano, salt and pepper in a small bowl. The ricotta mixture can easily be made a day ahead, then kept covered and refrigerated. Next comes the puff pastry. Place the sheet of puff pastry on a parchment lined baking sheet and prick with a fork, leaving a 1/2-inch border all the way around. Spread the ricotta mixture evenly inside the border. Then, place the asparagus stalks in a single layer on top of the ricotta mixture. The 4-6 ounces of asparagus is an approximation. We just lined up asparagus next to the puff pastry to see what would fit, trimming the asparagus as need be. You may use more or less depending on the size of asparagus. 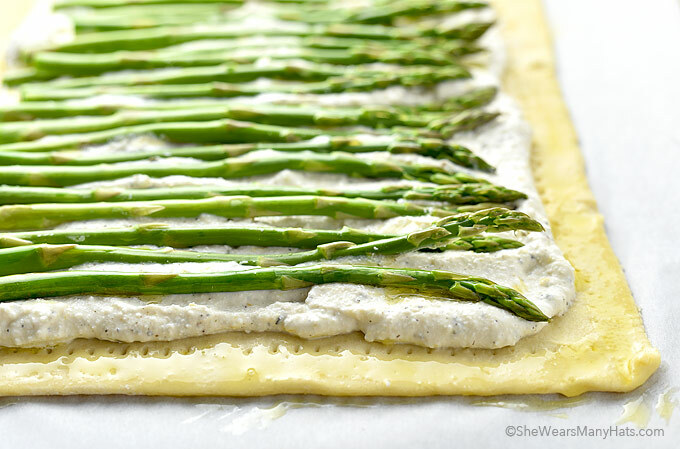 Finish by evenly brushing olive oil on the pastry and asparagus. Bake at 425-degrees F until the puff pastry is golden and puffed. Serve warm. This easy savory tart is perfect for your next brunch or as a side dish for a lovely compliment to any meal. 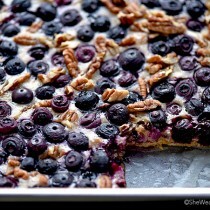 Preheat oven to 425-degrees F. Line a large baking sheet with baking parchment. 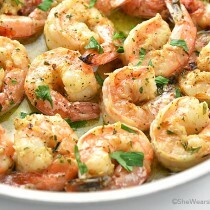 Mix together the ricotta, grated garlic, lemon zest, oregano, salt and pepper in a small bowl. Set aside. Place sheet of puff pastry on parchment lined baking sheet. Prick with a fork, leaving 1/2-inch border. Spread ricotta mixture evenly inside of border. 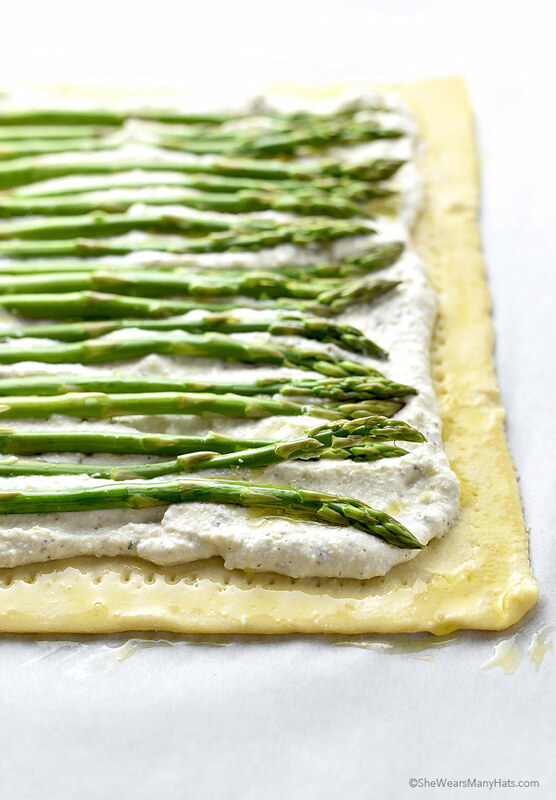 Place asparagus in a single layer on top of ricotta mixture (trim asparagus as needed to fit). 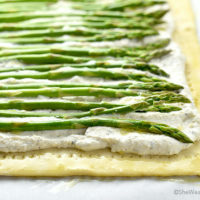 Evenly brush top of pastry and asparagus with olive oil. Bake at 425-degrees F until puff pastry is golden and puffed, about 20 to 25 minutes. Serve warm. *If using frozen prepared puff pastry, thaw according to package instructions.